Product #45956 | SKU ARE-C2P | 0.0 (no ratings yet) Thanks for your rating! Restore power to your lithium-ion, NiMH, and Ni-Cd batteries with the ARE-C2+ Four-Channel Smart Charger from Fenix Flashlight. 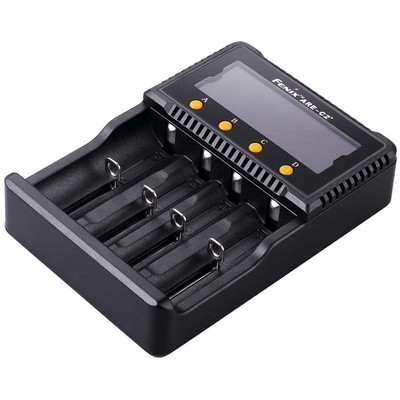 It's compatible with 18650, 26650, 16340, and 14500 li-ion cells, as well as AA, AAA, and C Ni-MH and Ni-Cd batteries. The unit can charge batteries of different sizes simultaneously. It also performs independent monitoring and charging of each cell, and automatically selects the appropriate charging mode to use. Additionally, built-in circuitry offers protection against overcharging, short-circuiting, excessive current, and reverse polarity. The ARE-C2+ runs on 100 - 240 VAC power, enabling use all over the world, and includes a power cord with a 2-prong North American plug. It can also accept 12 - 24 VDC power for on-the-go operation via the optional vehicle adapter. As an added benefit, a convenient LCD screen displays cell type, voltage, and charging status.